The Sassy Foodophile: Polish Much? responsibility to make his journey memorable. The first time, I made him taste the real smoked meat from Montreal at Dunns (Shwartz was a bit too far) and a good old poutine. Most of the people are disguted at the idea of fries covered with gravy and cheese curds but it is a delicacy here! Especially after a good night of dancing and drinking, nothing feels better than a big poutine at la Banquise. Although, I would not say that they serve the best poutine. Décarie Hot Dog wins big time with its larged-cut fries, a real good and flavorful gravy and that cheese that make 'squish squish'! Mmmm mmm mmm!!! So this time, I decided to make him discover the multiethnicity of Montreal and at the same time, I could try something new! It was a very cold day and we have walked for a long time. We needed something that will warm us from the inside out! 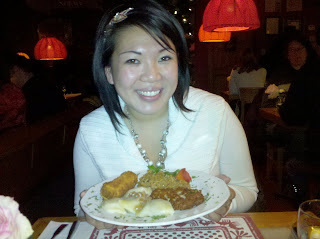 Why not try this Polish restaurant in the old port! I have tried some Pierogies in the past but never the real ones and I know very well that Polish meals are filled with carbs, nothing better than carbs in a cold winter day! So in we go in Stash Café. This restaurant has been recommended by a polish friend I go to school with. She says that she brings her parents there everytime they come visit. So I figure, it must not be bad. My motto when trying out restaurants from other cultures, if the tables are filled with customers from this culture, I may assume that this is authentic cuisine! As we opened up the menu, there was a choice of à la carte or a discovery menu! I was super excited, I wanted to taste EVERYTHING! I ordered the primer, a little bit of everything for 'the novice to Polish cooking'... I believe that is me. My friend ordered the roast of wild boar, grrrr! 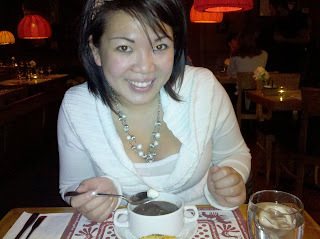 As an appetizer, we each had a soup. Borsch. Don't ask me to pronounce it, I might sound a bit This soup is a classic in polish cuisine. Made out of red beets, it has a pleasant sweetness to it and the sour cream topping was supposed to balance the saltiness of the soup. But I must say it was quite intense and somehow too salty, even with the sour cream. Then came a simple green salad. Like I said, simple. Some mixed greens with beets (they love beets I think) and a home-made dressing. Good. My friend's dish was really delicate. It was a few slices of boar that was marinated in a sweet sauce (I believe made out of beets). The boar was very tasty and gamey. A flavor unlike any other red meat as a matter of fact. Very tender too. It was clear that this piece of meat was simmered for a long time.